As a teenager I was obsessed with making pottery. I had access only to the electric kilns and low-fire glazes in my New York City school’s tiny ceramics room, but I longed for the mysterious vitreous stoneware that I saw in pictures and read about in the few books that I could get my hands on: Glenn Nelson’s Ceramics: A Potter’s Handbook, Bernard Leach’s Potter’s Book, and Herbert Sanders’s World of Japanese Ceramics. If gas kilns were beyond my urban reach but existed somewhere out there, salt kilns were completely otherworldly. I knew of Karen Karnes—probably from a Ceramics Monthly article—but she seemed to inhabit the inaccessible elsewhere of salt glaze, a place of unimaginable technical and logistical achievement and authentic authority. When I wandered into America House one afternoon, I couldn’t believe that her work was there, for sale right on 52nd Street, available for anyone—even me. I bought the smallest cut-lidded jar, the one I could afford. It cost fourteen dollars, a dollar for every year of my life, and it meant giving up some trips to the Fillmore East, my other obsession at the time. I was aware that it was not the fanciest pot on the shelf. Neither textured with rich glass, nor colorful, nor grand like some of its neighbors, it was the size of a mug: somber, salt-speckled, matte brown, with a band of yellowish oxide wash around the shoulder. But unmistakably Karen Karnes: the peaked waves of its faceted lid, the clean turned-in foot over which an elegant cylindrical body hovers, the crisp modernist lines, the perfect proportions, the balance. And yes, the palindromic KK stamped on the foot. I was elated. I have had that little pot for more than forty years now. It was probably the very first pot I bought in what has turned out to be a life of working in clay and acquiring pots. Though it has a few chips on its lid, I still see what drew me to it. Even then I realized that Karnes had forged an extraordinary, meaningful, and intimate relationship with her materials and process. That particular form, the jar, was the apotheosis of that privileged relationship: It was so unmistakably hers that it seemed to carry her identity as an artist and embody all her insights, secrets, and creative power. And its salt glaze was the perfect marriage between form and surface. Karnes’s salt-glaze process did in fact evolve from her desire for a more essential and harmonious connection of surface to form. She had been experimenting with unglazed surfaces on the outside of her pots in her oil-fired reduction kiln in the mid 1960s, but the unglazed clay was uninvitingly dry and sandpapery to the touch. Mikhail Zakin, her friend and collaborator, describes Karnes’s disappointment at the rejection of an unglazed teapot from a competition around this time. In contrast, she recalls how excited Karnes was upon returning from North Carolina where she had first witnessed salt firing. The sodium glaze, with its appealingly textured, sensuously smooth surfaces, was exactly what she wanted. She saw it as a “whole new thing” and immediately made plans to build her own kiln. With salt, she could concentrate on form, which had always interested her more than surface. She liked the intimate and organic relationship between the body and its exterior, as if the sodium vapors were causing the pot to “perspire its own skin” . The result was a more integrated process that cut out the willful and potentially capricious step of glaze application, which she was glad to leave behind . The directness of the process, and the elevation of the kiln’s collaborative and serendipitous role in determining the outcome of work—the “real involvement with flame and fire” —suited her perfectly. Karnes’s first exhibition of the salt-glazed pottery was with Zakin at Shop 1 in Rochester, NY, at Frans Wildenhain’s invitation. Wildenhain, the head of the ceramics program at the School for American Craftsmen at the Rochester Institute of Technology, was one of Shop 1’s founders. The show announcement gives a sense of how novel the process seemed at the time: “After extensive experience with other glaze methods, Karen Karnes and Mikhail Zakin…[have] decided to explore the special challenges of modern salt glaze stoneware. Both potters feel that, with each firing, the salt kiln contributes anew some marvelous, half-anticipated variety and drama of glaze expression” . Karnes says of salt-glazing: “It forced me to leap into another place, and once the leap was made, I kept growing” . With her salt kiln in place, she began her longest and deepest exploration of a single form: the cut-lidded jars (of which the one I bought is an early example). Paulus Berensohn, author of Finding One’s Way with Clay, tells of a revelatory moment when she first cut one of these lids during a workshop at his farm in Pennsylvania. He recalls that she had mislaid her wire and was offered one made of two coarse twisted strands by a student. When she cut a lid off the wheel with the borrowed tool, the striking effect was observed by all present . “Striated planes like plowed fields that float over the landscaped mountains,” she later described these marks . In leaving them in place on her lids, it was as though she had flipped the jar upside down in space, transposing to the top of the pot the familiar marks of the wire parting the wet clay from the wheel head. It was a conceptual shift that further contributed to their uncanny power, and the cut lidded jar became her signature piece . She made many variations of this pot, playing with proportion, scale, and surface over a thirty-year period from the late 1960s until she stopped throwing on the wheel several years ago. These pots show a range of effects: firing marks from different kiln placements, variations in the texture of the salt glaze and color (from the composition of the clay body, as well as from areas of applied color oxides), even pressed-on clay additions. They evolved from the early small jars like mine, where the lid barely overhangs the lip (in effect, a personal take on a jam pot) to the monumental woodfired jars of the 1980s, with their massive, broad lids that are often wider than the foot itself and seem without precedent. She has explored the extremes of squatness, where the lid has almost as much visual presence as the body and reinforces the impression of a spreading landscape, and tallness, where the feeling of upward reach is elegantly evocative of the figure. The silhouette of these pots recalls for me the woman in John Singer Sargent’s Fumée d'Ambre Gris (1880) and certain Tang Dynasty figurines. Other examples, with their skull-like craniums and jaw-like tapering, call to mind the human head. As closed lidded forms, they offer the mystery of undisclosed but promised interiority: they call on you to physically engage and with two careful hands, remove the lid to look inside. And with some of these jars, you need to think of a place to put down the lid—some are as broad and almost as heavy as a flagstone. The development of these jars is best understood in the context of Karnes’s regular Friday afternoon trips to the city, where she visited galleries and museums, particularly following the work of the New York School painters. Many of these artists (some of whom she knew from Black Mountain College, such as Jack Tworkov and Franz Kline) had hit their stride in the mid-1950s, working in depth in series of tightly defined formal parameters that were instantly identifiable as their own. Think, for example, of Mark Rothko’s signature paintings of symmetrical rectangular blocks of color. 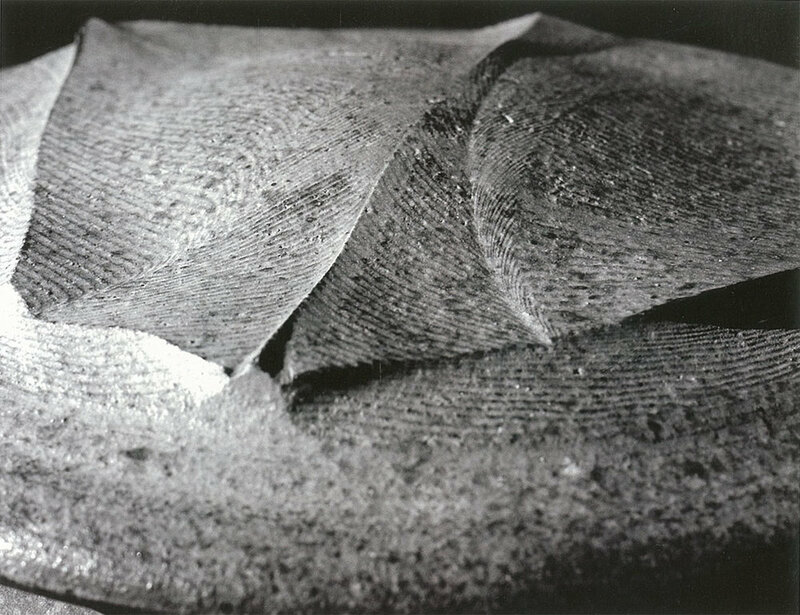 While such repetition of a form falls well within the general practice of studio pottery—potters might make certain functional covered jars over a long period—Karnes’s lidded jars’ originality, ambitious scale, instantly recognizable formal structure, and expansive serial variation, echo the creative model of the abstract expressionists she admired. Interestingly, as she says in her own narrative, she stopped going to galleries in the city and retreated to her studio as the art scene shifted from this style. I had perceived Karnes’s stature, sensed her power as an artist, and made a palpable connection to her when I bought my little jar. Later, after she first invited me to participate in the Old Church Pottery Show that she curates annually, I had the pleasure of slowly getting to know her personally. But it is only in the last several years in researching this project that I have come to understand the historical significance of her unusual life. Karen Karnes’s life in art, from the Bronx Coops to Brooklyn College and from Black Mountain to northern Vermont, is one of the great stories of modern object makers. Karnes was at the center of much of the important social and cultural history of the twentieth century, as the essays in this book reveal. Her life’s story intersects with the opportunities opened up by the revitalizing of public education after the Second World War, with the enlarging possibilities of second-wave feminism, and with experiments in communitarian living. Her work as an artist adds to ongoing conversations about tradition’s role within the avant-garde, about the synthesis of European Modernism and Japanese aesthetics, and about contemporary and personal interpretations of historical studio practices, particularly salt glaze and woodfiring. She helped invent the world of studio pottery in which my generation and beyond dwell. Karnes’s life pivots on her move from the collapsing Black Mountain College in 1954 to the founding of the Gate Hill Cooperative in Stony Point, New York, with a group of committed and idealistic artists from the college. Visiting the Gate Hill Cooperative’s fiftieth reunion celebration with Karnes in 2004, I was struck by just how visionary they had been. The architecture, influenced by Paul Goodman and Buckminster Fuller, and their attempt to integrate life, art, family, and community were prescient, foreshadowing what would unfold in the culture more than a decade later. Gate Hill was an inspired solution to the problems Black Mountain’s dissolution called up. As Slavoj Zizek said recently, “The genuinely utopian moments are not when you are doing okay… but when you are in a deadlock. Then, in order even to survive normally, you are forced to invent something” . The founders of Gate Hill invented something that would shape Karnes’s and many other lives for decades. This book begins to chronicle this important and little known piece of American cultural history. Gate Hill offered a way of answering the tension between the desire for community and the need for solitude that strikes me as being at the heart of many artists’ lives. Although Karnes is a famously private person by temperament and fiercely maintains her boundaries, she has participated throughout her life in communitarian experiments. Yet she also found the separation of individual and community that the others envisioned at Gate Hill to be inadequate. She insisted that her studio and house be set in a field at a distance from the live/work clusters of the other artists up on the hill. She argued that the need to be near the kiln required this special arrangement. While a case could certainly be made for this convenience, Karnes has acknowledged her fundamental desire to be set apart, her deep need for a silent, contemplative space. Christopher Benfey connects her personal paradox to a larger historical impulse of “cultivating individuality through community.” Certainly this was a central issue within Karnes’s intellectual milieu. For example, her first mentor, the Chechen-born British architect Serge Chermayeff, wrote a seminal book with Christopher Alexander, Community and Privacy (1963), that envisioned an architecture that might foster and reconcile these two impulses within a planned urban environment. The privileging of traditional works of art of an unsentimental essence and their inclusion in a forward-looking canon call to mind many of the qualities of Karnes’s pottery. It has a directness and clarity of purpose, an unadorned fidelity to the nature of her materials. After all these were objects to be used. As Mikhail Zakin puts it, Karnes’s work comes from “a distillation process; the final piece has to have nothing inessential” . In her life as in her art, her ascetic paring away of the superfluous resonated with the broader aesthetics at play in her avant-garde community. In the photo of Karnes at home at Stony Point in the late 1950s, her pots are right at home with the Eames chair and the clean, hard-edged architecture with its untrimmed windows and exposed steel-truss rafters. Karnes’s participation in vital cultural movements—and her contribution to them—emerges with clarity and complexity in the essays in this book, which offers for the first time a comprehensive record of her career. While Karnes has received numerous awards and honors, there has been no single-person museum survey of her work and only one stand-alone publication, Garth Clark’s excellent but modest catalog documenting her 2004 retrospective at his gallery. While a growing number of her peers have enjoyed the honor and bona fides of museum shows and major publications, her public exposure has not until now reflected the record of her artistic excellence or historical importance. Partly, this is an index of the general marginalization of craft, but the lapse also stems from some of what makes Karnes exceptional: her independence (she has never had the support that comes with university affiliation) and her emphatic identification as a potter (she refers to even her massive sculptural vessels of the 1980s and 1990s as pots). And though the tide has been shifting, women artists have been generally slower to receive recognition than their male counterparts, and this is no less true in clay. Each writer offers a particular take on Karnes. As a prolific ceramics scholar and Karnes’s dealer for over a decade beginning in the late 1980s, Garth Clark is the ideal person to introduce Karnes. His foreword shows his warm personal regard for the artist and connects her to the Modernist culture that was evolving around her. If Clark is the consummate ceramics insider, Christopher Benfey’s point of view on Karnes is from outside the field. An historian of American culture, he connects her life and work to broader themes, from the utopian impulses of the New England Transcendentalists to the internal debates at Black Mountain College. He brings his synthetic sensibility and intellectual range to invoke a series of contrasts that echo through Karnes’s life, placing her squarely at the center of many important developments in American culture. Jody Clowes’s essay zeros in on one such development: how the feminist movement that was unfolding in the 1960s and 1970s impacted Karnes. In spite of her communitarian history, she is a reticent joiner of movements, but Clowes shows how Karnes’s choices were nevertheless part of the sea change affecting women and the wider society, and examines how Karnes negotiated those tides to maintain and develop her own gendered sense of self, and to protect and nurture her creativity. Karnes’s career spans what might be seen as a golden age of craft, a time of growing interest in handmade objects and expanding opportunities and markets. The critic Janet Koplos brings her encyclopedic knowledge of the American craft movement to mapping Karnes’s career, reflecting on her experience as a member of a particular generation that came of age in the postwar period. But Karnes’s trajectory was unique: as she traveled through the terrain of collectively experienced events she often struck out on her own path. Where Benfey, Clowes, and Koplos engage Karnes through a variety of cultural and historical contexts, Edward Lebow trains his gaze on the pots themselves. His understanding of Karnes unfolds from the interpretation of individual works. While he takes note of Karnes’s sophisticated cultural and visual literacy—her exposure to a broad array of influences—his focus is on the formal internal movement of Karnes’s oeuvre, her development of a mode of expression that blends multiple evocative polarities in subtle and fluid ways. While the writers focus on Karnes through different lenses, they all portray a subject who refuses to embrace fixed identities: she elides, ignores, or explodes rigid categories, always moving from her own ineffable center. In one of her rare statements about her artistic practice she said, “The pots kind of grow from themselves—it’s a feeling. The forms will extend themselves—or contract. I feel my forms live in my body, on my breath” . In fact, whenever she does describe her creative process, she seems to invoke a profound somatic imperative, a force located within her body that is beyond her will or consciousness and is greater than herself: “It’s as if I am moving at the bottom of the ocean… [in] a big slow current that keeps going—that doesn’t mean it doesn’t change…but I’m just moving along” . The last essay, Karnes’s own, shows her intelligence and sly humor. One gets hints of her ferocious independence and famous generosity. Indeed, she is a person whose compromises have been few, her sacrifices many. Zakin describes her as “somebody who lives with total integrity to her value system. That has been a great lesson for me—that it can be done, that you can live that way” . Karnes has offered that lesson to several generations of potters and to those who have sought her out and live with her work. It is my hope that this volume will offer it to a wider audience. 1 Zakin paraphrasing Karnes in a conversation with the author, 22 October 2009. 2 Salt firing also made sense form a practical standpoint. It had been her practice to green-fire, applying her glazes to the fragile raw clay, skipping the typical step of a preliminary bisque firing to a lower temperature, which makes the pots easier to handle and more absorbent of glaze. And while Karnes had always been competent with glazes, like most modernists, she eschewed decoration, never painting on her pots. 3 Catherine Wright and Nancy Means Wright, Vermonters at their Craft (Shelburne, Vermont: New England Press, 1987) 46. 4 Show announcement, Shop 1 Gallery, Rochester, NY (1968). 5 Wright and Wright, 46. 6 Berensohn in conversation with the author, Worthington, Massachusetts, 26 September 2009. 8 While Karnes made her signature casseroles over an even longer period, perhaps due the strict demands of their function, they showed less formal development and are not as unusual ceramic forms as the jars. 9 Slavoj Zizek, interview, Democracy Now! 15 October 2009. 10 Mark Davenport, professor of music at Regis University, generously clarified for me the role of early music in this milieu, which he knows about both from his personal experience growing up at Gate Hill and his professional research. 11 Quoted in Carolyn Brown, Chance and Circumstance: Twenty Years with Cage and Cunningham (New York: Knopf, 2007) 18. 12 Don’t Know We’ll See: The Work of Karen Karnes, film, dir. Lucy Massie Phenix, 2008. 13 Wright and Wright, 46.